With its universal solutions, our GROHE Rapido SmartBox System is the answer for everything. Never before has a rough-in from GROHE offered so many different options and so much flexibility and freedom. And with the GROHE Rapido SmartBox System you can install the box now and decide on a trim in the future. So much technology into such a small space. A remarkable advancement for our customers. For installers, that means truly universal solutions. With one rough-in that fits all plates and that runs up to three shower functions and a range of ingenious features for ultimate efficiency of installation. For planners, that means more space and more flexibility than ever before, coupled with beautiful design. Our new GROHE Rapido SmartBox System: pure genius, reduced to the max. two rough-ins are normally needed. Which is a huge savings in work and effort. The GROHE Rapido SmartBox makes adapters practically redundant. It has ½" connections, made to fit all standard pipes. Where other rough-ins with ¾" outlets are made to fit the exception not the rule, the GROHE Rapido SmartBox is designed to fit 90 % of all pipes. Smart, isn’t it? Efficient piping leads to efficient installation. 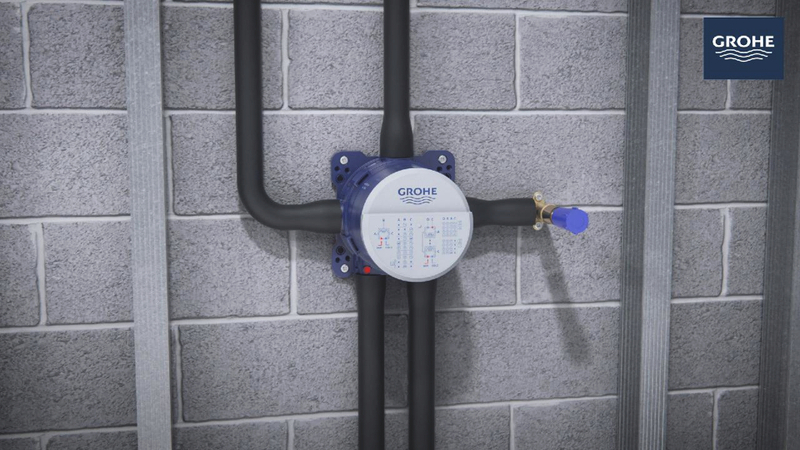 The GROHE Rapido SmartBox comes with bottom inlets, enabling a direct connection to the hot and cold water supply. That makes 90° fittings a thing of the past. Why take a detour when you can take the direct route?